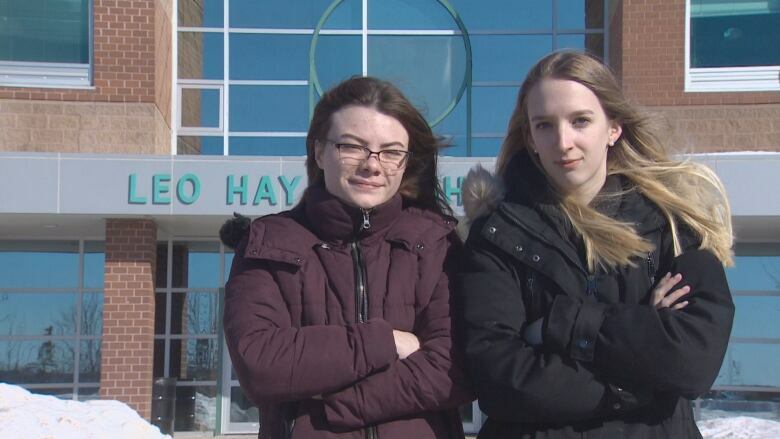 When Leo Hayes High School students Emily Davis and Emma McCluskey set out to make a documentary about underage vaping at their Fredericton school, they never imagined it would make waves beyond their journalism class. Now their video has sparked an outcry from some of their peers and opened the eyes of some adults. "We wanted to look into how many kids were doing it," said Davis. She surveyed 60 students asking if they'd ever seen someone vaping on school property. Ninety-seven per cent said yes. "It's something we see on a daily basis," McCluskey said. Vaping devices heat up a packet of liquid, which turns into an aerosol that's inhaled and exhaled amid clouds of smoke. Critics say the variety of candy, dessert and fruit flavours are attractive to children. One pod can contain as much nicotine as a pack of cigarettes and Davis and McCluskey said they sometimes observe schoolmates consuming a pod in one hour. "We're the guinea pigs for vaping," Davis said. "They're not going to know until we are older what the long-term effects of it are." Students use several techniques to hide vaping in the classroom. "When I was in Grade 11, I had a lot of girls in my classes that would do this," Davis said. "They would vape, and they would breathe it into their purses, and before the vapour could go up they'd zip up the purses super quickly so that it would stay in the purse." "People also do that with water bottles," McCluskey added. "They vape into their water bottle, and just close their water bottle, so that doesn't escape." Other students blow vape clouds into their sleeves or simply hold their breath until the cloud dissipates and they can exhale without a visible cloud. But it's in the bathrooms where clouds fly freely. "They don't have to hold it in because there's no teachers monitoring the bathroom," Davis said. McCluskey and Davis said some teachers approached them after watching the video, saying they had no idea students were vaping in their classrooms. 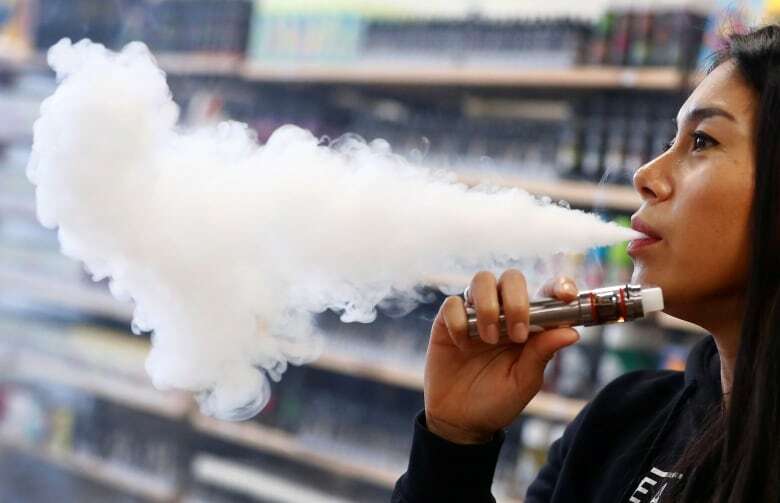 It's illegal to sell vaping products to people under 19 in New Brunswick, but that doesn't stop minors from getting hold of them. As part of their documentary, McCluskey went into a shop and purchased a vape. The video from inside the store clearly shows the clerk did not ask to see ID. 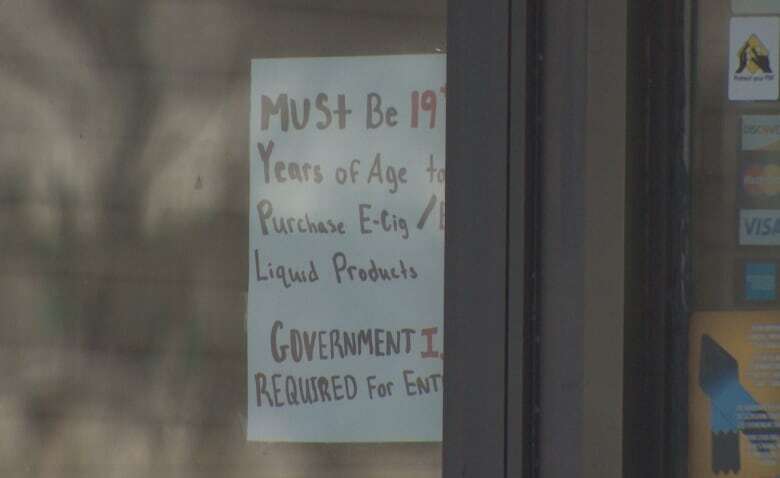 Since the release of the video, the shop has changed ownership and name, and there is a sign in the front window saying "Must be 19 Years of Age to Purchase E-Cig" products. CBC News asked the same clerk at eJuice, now called "King Vapor," if anything had changed since the video. The clerk replied that he asks people for ID, and the sign might have changed. McCluskey and Davis said their video has elicited positive feedback from adults, but numerous students are angry at the pair for exposing the vape store. "They act like its their right to be able go in and get it, when it's illegal to do it," McCluskey said. The documentary has been taken down from YouTube because students who participated didn't want their parents to see them vaping, and because McCluskey and Davis were getting hateful comments online. The pair said they were called rude names and disturbing things were written about them, but no one has confronted them in person. McCluskey added that when they interviewed their principal, he didn't think students were buying vapes themselves. The principal told CBC News that in light of Davis and McCluskey's documentary, the anti-tobacco teen-led group will be expanded to include vaping.